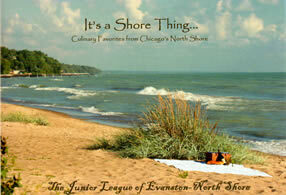 Our magnificent cookbook titled “It’s a Shore Thing: Culinary Favorites from Chicago’s North Shore” has been endorsed as “The Official Cookbook of Chicago’s North Shore” by Chicago’s North Shore Convention and Visitors Bureau. The recipes are favorites of our members, local personalities, and celebrities with ties to the North Shore, and well-known restaurants. In additions to recipes and entertaining tips, the cookbook also includes an historical walk through the villages and townships that make up Chicago’s North Shore. Purchase yours now at the JLE-NS Thrift House!